Шаг вперед? О компании Gigabyte мало кто слышал, хотя она уже давно и успешно зарекомендовала себя на рынке комплектующих для настольных ПК, а теперь они делают еще и очень интересные ноутбуки. В этом обзоре мы рассмотрим U24T, компактный универсальный ноутбук для мультимедиа. 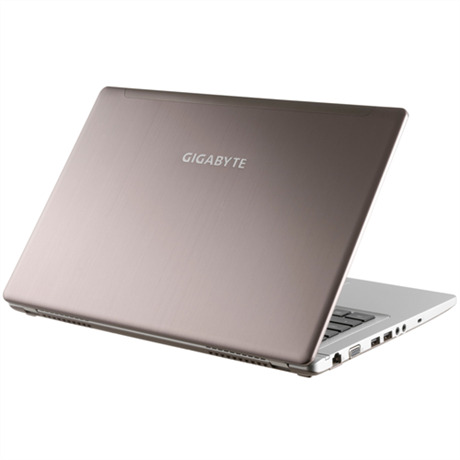 The U24T is Gigabyte's vision of the 14" ultrabook. The Gigabyte U24T is a good-looking ultrabook with quality components that perform well, but all of this is compromised by a simply horrific display. There's no way we can give it more than three stars with a screen this bad. With the Gigabyte U24T-CF1 ultrabook you get Intel’s latest processor technology, solid-state and traditional storage drives, and game-worthy graphics in a slim 14-inch ultrabook form factor. The Gigabyte U24T-CF1 offers fourth-generation Core i7 processing power and Nvidia graphics muscle in a slim 14-inch ultrabook chassis. There's a lot to like about the Gigabyte U24T-CF1. It uses the latest Intel Core i7 processor to deliver strong productivity performance, and its 10-point touch screen display allows you to take full advantage of the Windows 8 touch experience. When your work day is done, you can enjoy relatively smooth gaming action thanks to its Nvidia GT750M graphics solution. Our only gripes with this ultrabook are screen related; its 1,366 by 768 resolution is too low for a laptop in this price range, and off-angle viewing is subpar. If display quality is a deal breaker, check out the Samsung Book 9 Plus or the MacBook Pro 13 (2013), both of which have earned our Editors' Choice for high-end ultraportable laptops.